Shaded relief map of northern Oman. The New Year finds me half-a-world away from William & Mary on a research trip to Oman. 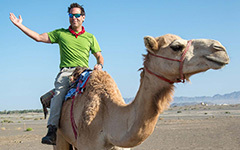 I am here starting a project focused on Oman’s spectacular geology and also laying the groundwork for a W&M study abroad field program that will focus on Oman’s iconic geology, its desert environment and distinctive culture. This trip is supported in part by William & Mary’s Reves Center for International Studies. I arrived in Muscat on December 29th and was joined the following day by Alex Johnson, our Geology Department Research Fellow. My research here is focused on quantifying the kinematics of faulting and the mechanism by which the Oman ophiolite, a vast slab of oceanic crust and deep mantle, was emplaced at the Earth’s surface (the name ophiolite is derived from the Greek: ophio for snake and lite or lithos for stone). Globally, ophiolites are rare and their origin enigmatic. When tectonic plates collide, dense ocean crust typically sinks back into the deep interior of the Earth in a process known as subduction, whereas the less dense continental crust crumples to form mountain ranges. On rare occasion however, ocean crust and the underlying mantle are tectonically shoved onto the continental crust and ophiolites are created. The Oman ophiolite is the world’s largest and best-exposed ophiolite. It is a unique setting in which to understand the dynamics of faults that place rocks from the sea floor and the deep Earth literally at our feet. Ophiolite terrain rising above the Oman desert. 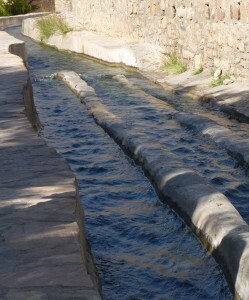 The flowing waters of Falaj al Khatmeen in the village of Birkat al Mawz (literally “Pool of Bananas” from the crop grown by these waters). 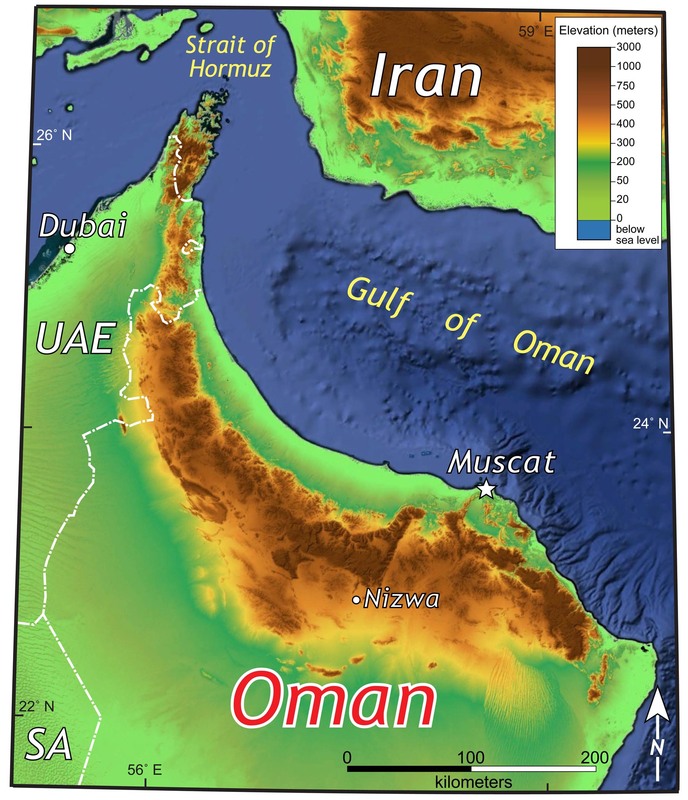 The ophiolite is well exposed because Oman is a hot and exceptionally dry country (with an average annual precipitation between 100-150 mm or 4 to 6 inches). They manage and conserve their scarce water resources with Omani’s long-ago developed aflaj, a communal system for collecting and transporting either surface or shallow ground waters via tunnels and channels to villages for domestic and agricultural use. My friend and colleague, Professor Abudullah Al-Ghafri took us on an Aflaj tour in the highlands near Nizwa. Dr. Al-Ghafri spoke on this topic while at William & Mary last spring, but to see these ancient structures conveying their life sustaining water was powerful. Over the next two weeks we’ll be doing fieldwork in the mountains of Oman and meeting up with Omani colleagues to learn more about their country. We’ll also post an array of dispatches that we hope will vividly document our geologic adventures in Oman. Fantastic Chuck! Have a great time and bring back an ophiolite rock suite for us! !